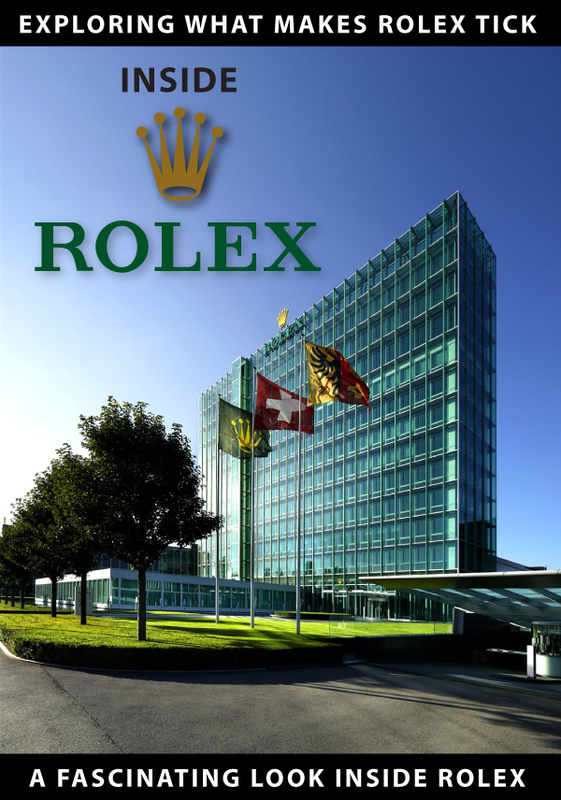 Welcome to RolexMagazine.com...Home of Jake's Rolex World Magazine..Optimized for iPad and iPhone: Paul Newman Daytona Third Engraving Discovered!!! 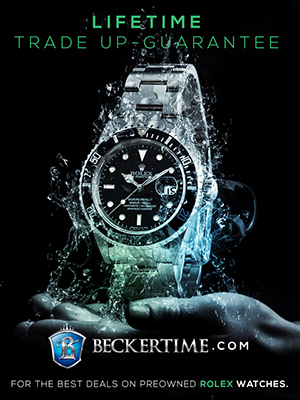 Paul Newman Daytona Third Engraving Discovered!!! 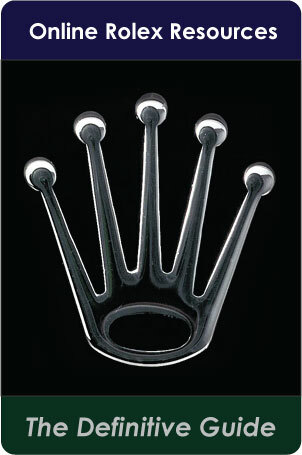 This is beyond exciting!!! Nick from Deployant.com sent me an email and I almost fell out of my chair when I saw what he had to share with me! 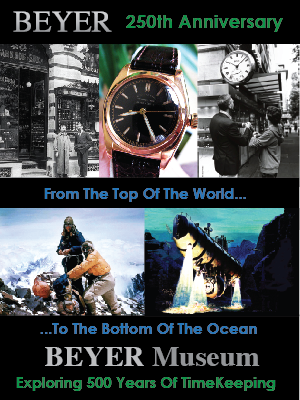 Nick just published a story that showed for the first time, the caseback engraving on a 3rd Paul Newman Daytona, which is seen above. Why is this so significant you ask? Becuase Paul Newman's actual Daytona is coming to auction later this month on October 26th at Phillips Auction House in New York. 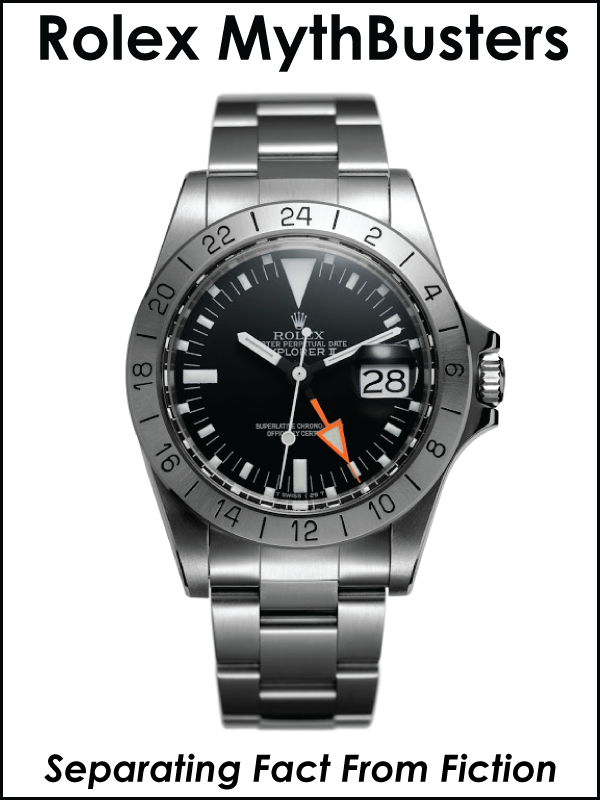 Let's take a look at the background. 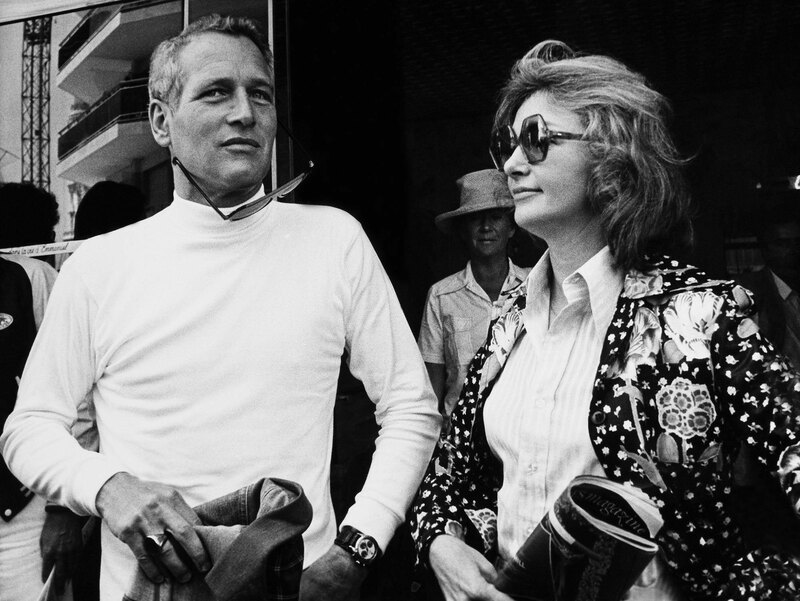 Paul Newman is pictured above with Joanne Woodward, as well as below with probably in early 1980s. 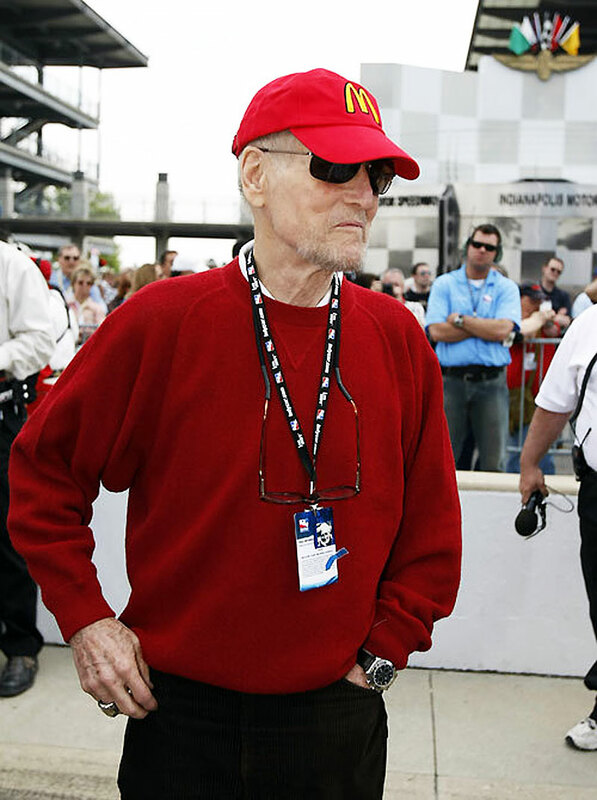 When I was writing this article, I reached out to Paul Newman's best friend, Stan Barrett to gain insight into the relationship between Joanne and Paul. 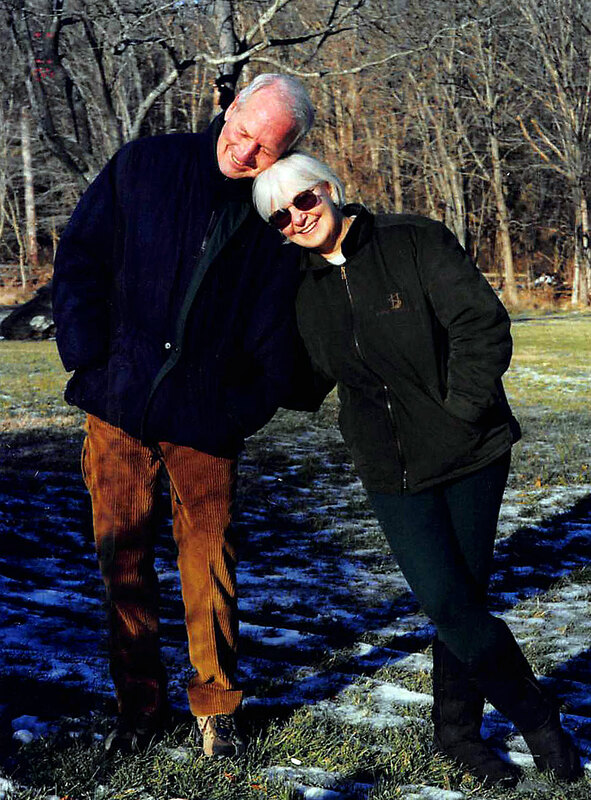 Stan sent me the previously unpublished photo below that he took of Paul Newman and Joanne Woodward—ironically striking a pose somewhat similar to the one in the photo pictured so many years earlier of them leaning against each other, standing in front of trees. 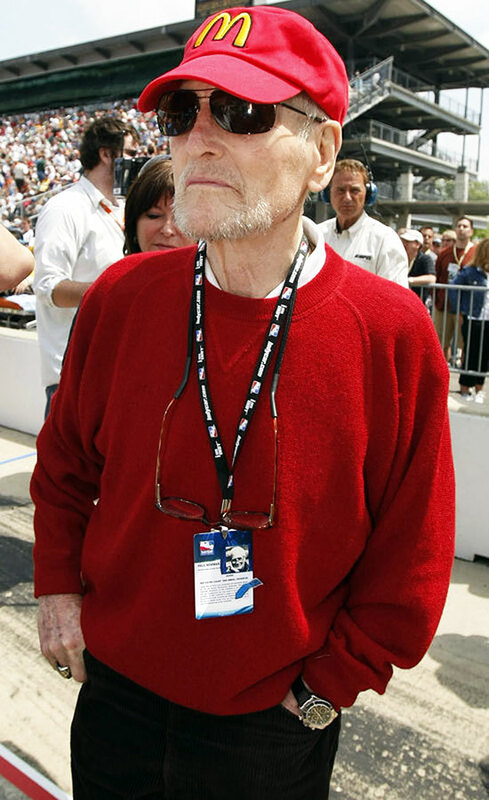 Paul Newman is pictured below wearing his trademark White Exotic Dial Rolex Daytona that his wife, Joanne Woodward gave him as a gift back in 1972. 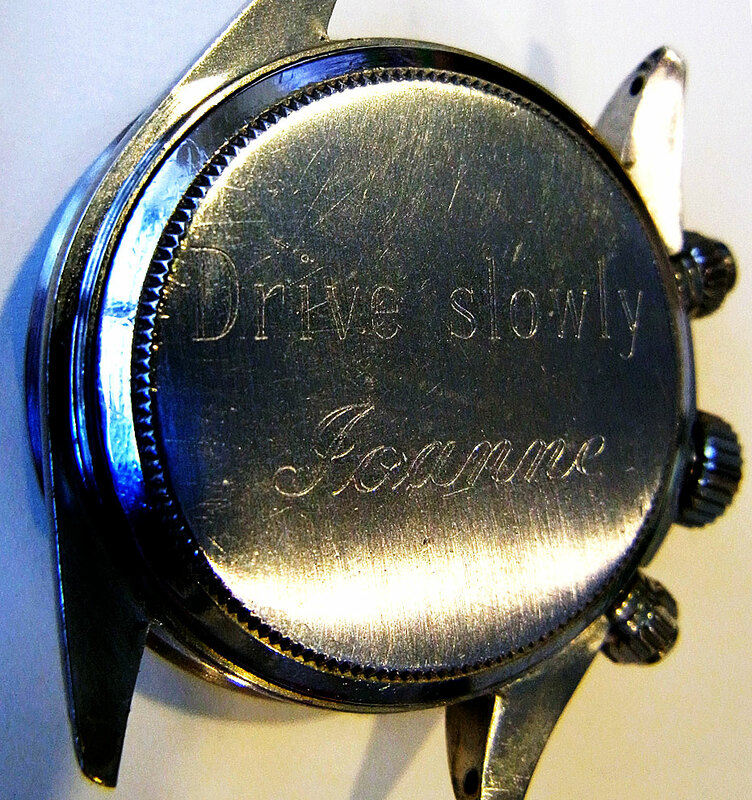 Joanne Woodward had the back of the Daytona engraved, DRIVE CAREFULLY ME, as seen in the photo below. 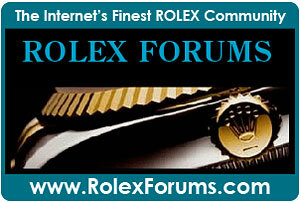 Where did Paul Newman's wife, Joanne Woodward get the idea to buy Paul a Rolex? 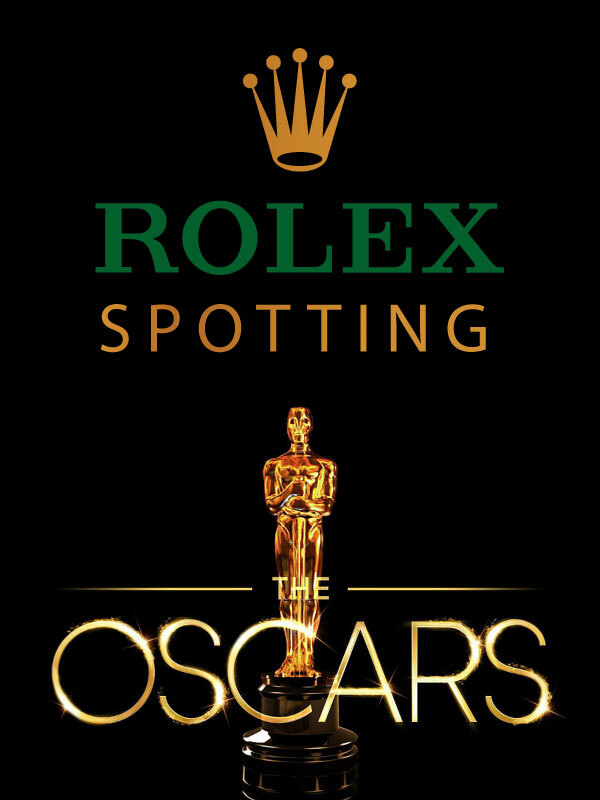 Maybe it was on Marlon Brando's recommendation? 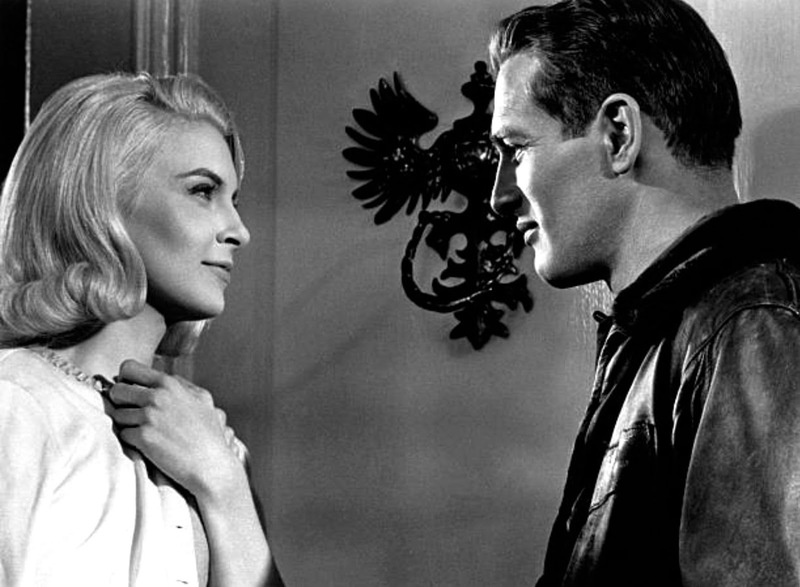 We see Marlon Brando in the video below with Joanne Woodward from The Fugitive Kind in 1959. 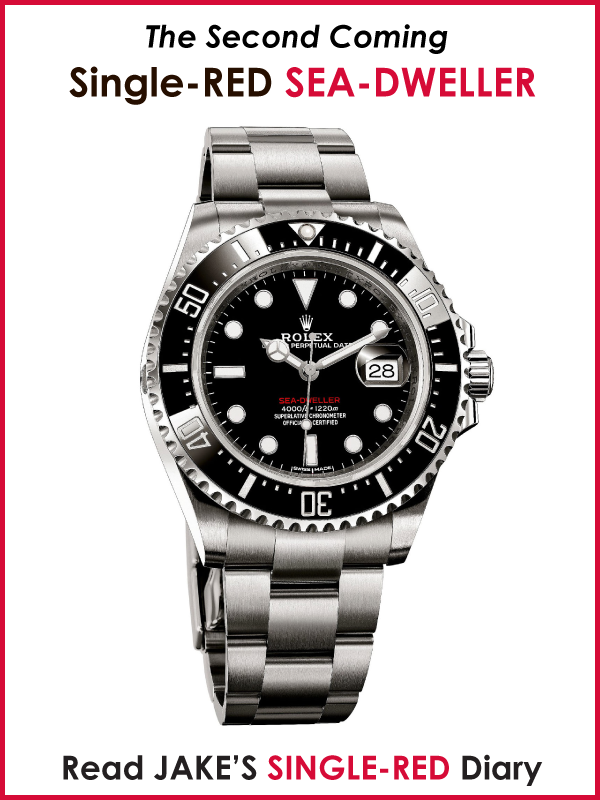 Joanne Woodward gave her husband, Paul Newman his second Daytona, which featured a black dial, as seen below. 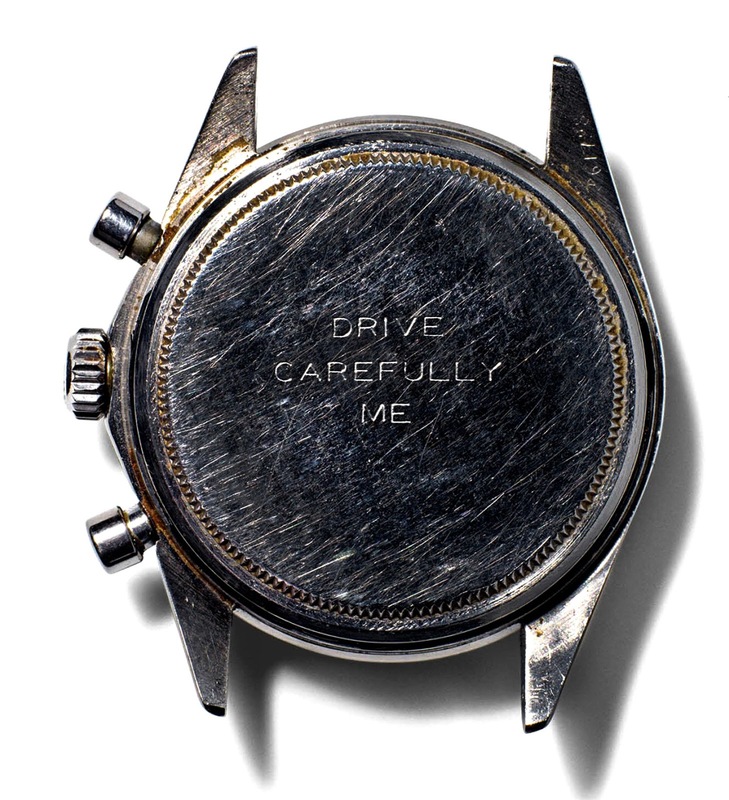 Joanne Woodward had this second watch engraved on the caseback with the words, Drive slowly —Joanne." 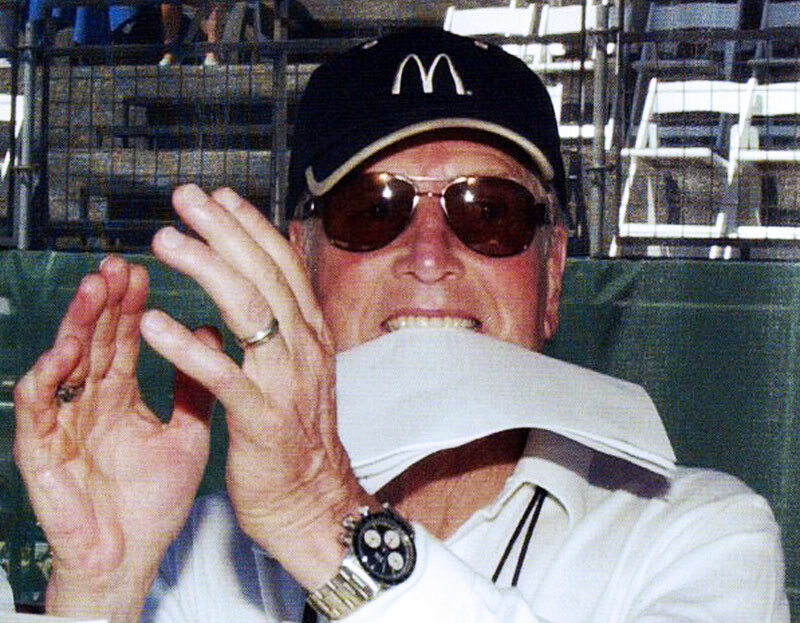 Paul Newman owned and wore many different Rolex Daytona models, and I discovered the White Gold Daytona pictured below on Paul's wrist back in 2008. 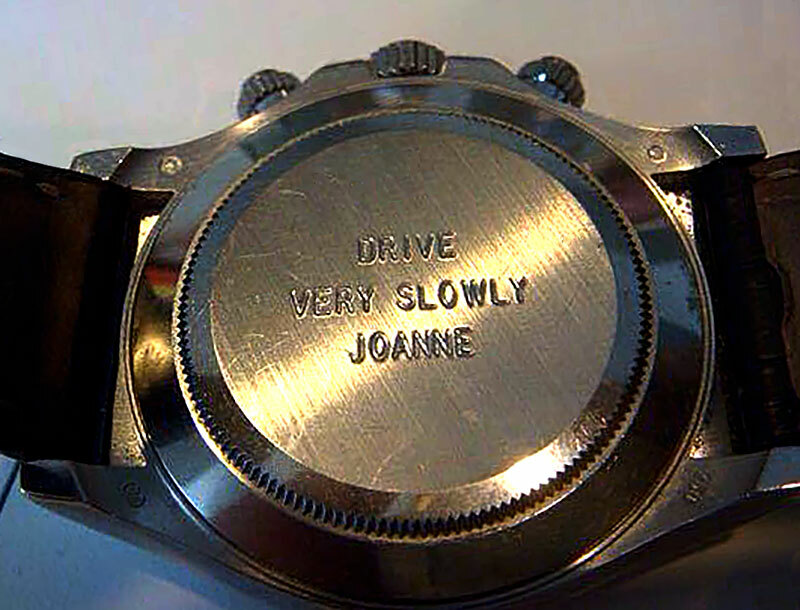 The photo below shows the new piece of this puzzle, which is the never before seen engraving on the back that is a play on the first two engraved Daytona models, and this one simple reads, DRIVE VERY SLOWLY JOANNE. 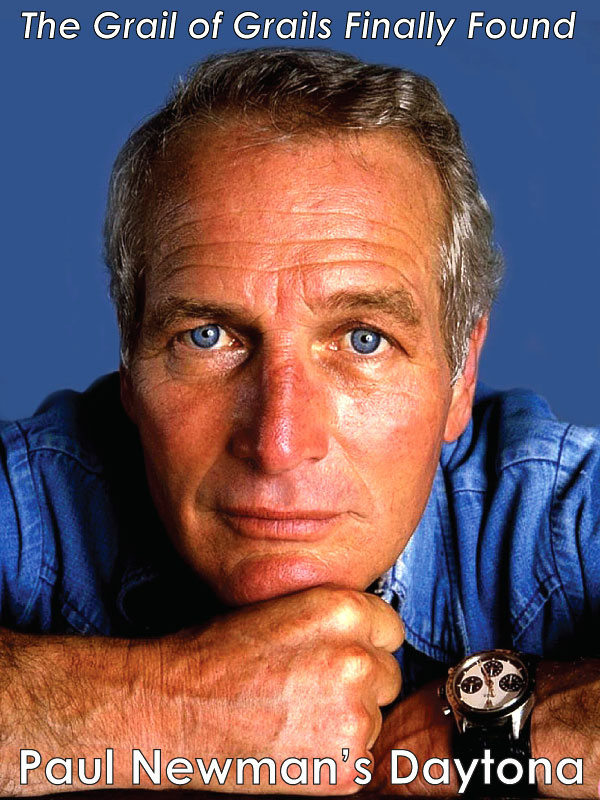 Paul Newman wore Rolex Daytona models up until the day he died. 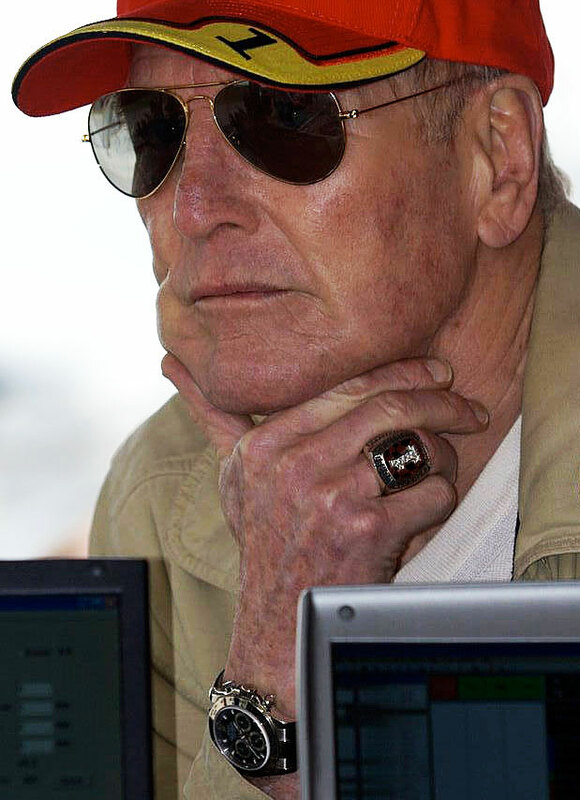 The photos below are two of the last photos ever taken of Paul Newman, and they show him at age 83 hanging out at the track one last time, as he watches the cars racing around the track, and he is wearing his white gold Daytona, with the engraving from his wife Joanne. 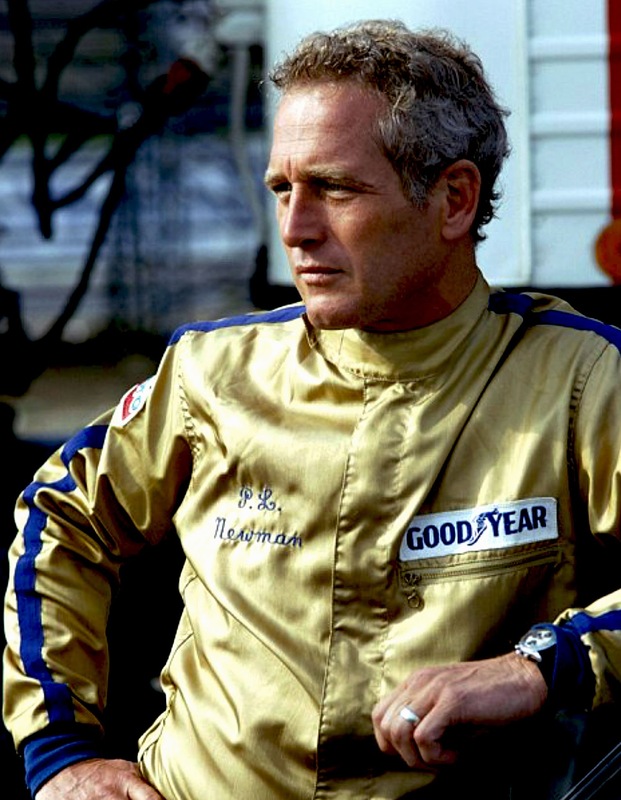 Paul Newman loved racing cars, and watching car races, and he loved wearing his Rolex Daytona watches. 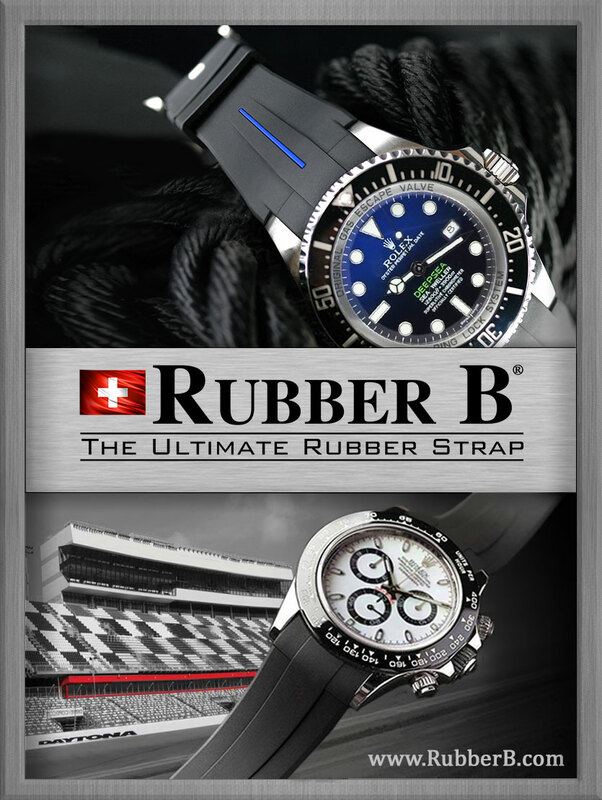 More importantly, the great takeaway from this story is Paul Loved his Daytona watches that his loving wife Joanne gave him with here engravings on the back.